The combination of creatine bonded to a glucose molecule results in superior absorption and delivery of creatine into the muscle tissue. The main mechanism behind the enhanced absorption stems from the increase of insulin production due to the presence of glucose which facilitates creatine storage. In addition, because of the bonded creatine - glucose structure the creatine moves through the stomach and is absorbed through the intestine more easily than other creatine forms. This provides the user with a creatine product that offers the performance benefits of creatine through an enhanced delivery system. Creatine supplementation can benefit anyone who is looking for improvements in their training like lean muscle development, strength or power. The production of adenosine triphosphate (ATP) which is the main source of energy during high intensity exercise is highly dependent on the presence of phosphocreatine (PCr). Supplementing with creatine leads to a greater availability of (PCr) in the muscle tissue. Hence, supplementing with creatine can lead to a faster rate of ATP re-synthesis and thus a greater recovery between high intensity exercise bouts. 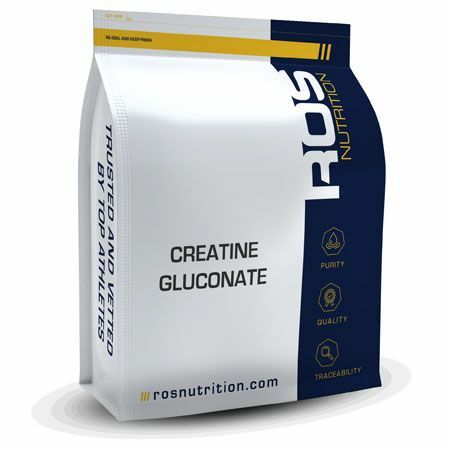 Creatine gluconate mixes well in water and is said to taste better than other forms of creatine. Jowko E, Ostaszewski P, Jank M, Sacharuk J, Zieniewicz A, Wilczak J and Nissen S. Creatine and beta-hydroxy-beta-methylbutyrate (HMB) additively increase lean body mass and muscle strength during a weight-training program. Nutrition 17: 558-566, 2001. Take 3-5 g of creatine daily – 1 hour before your training.